Sony's DVD disc art design has users believing they've been sold a pirated copy of the movie "The Girl with the Dragon Tattoo"
Sony's disc design for the hit movie "The Girl with the Dragon Tattoo" might have backfired, with reports of users complaining that they're receiving a "pirated" disc with their purchases. 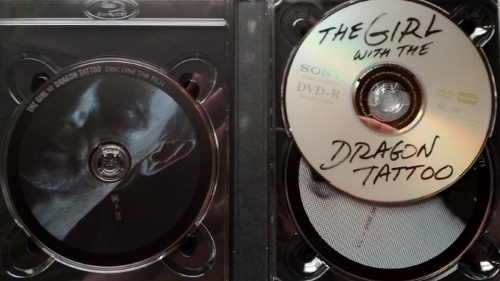 Sony designed the DVD disc art of the American remake of "The Girl with the Dragon Tattoo" to fit into the spirit of the movie, as the film's main character, Lisbeth Salander, is a computer hacker. The disc art resembles a self-burnt DVD-R, one that Lisbeth might have used herself. But it appears that the disc looked too much like a self-burnt one, with reports that users have started complaining about receiving a "pirated disc" with their purchases. The problem may be so severe that disc rental firm Redbox has had to make a public warning on the issue, to tell customers that, yes, the disc they have is indeed a real one. "The handwritten look on the disc of this movie is legitimate and is intended to look like a burned DVD," Redbox posted on their website. The Blu-ray discs (one for the film, one for extra features), available in a "combo" package along with the "fake" DVD, uses more traditional disc art, and this could possibly be adding to the confusion by making the DVD stand out more.